Today's item of the day is a soy candle from Madhatterspottery. 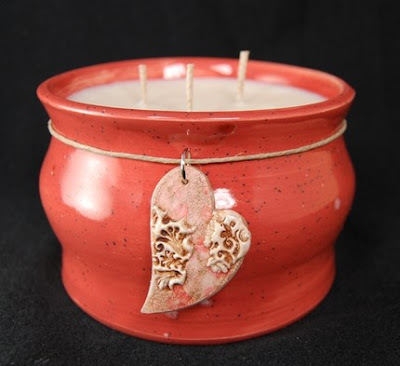 The candle pot is hand-thrown and the candle hand-poured, for a completely handmade gift. Even the heart charm is handmade (by MenagerieStudio). I would highly recommend Madhatterspottery ~ I have my own candle, that looks similar to this except in green (the charm is also by MenagerieStudio, in the shape of a bird, and too cute! ), and I love it! The scent is strong and lovely and the candle is long-lasting.